Home to our main head office and showroom, Leeds is on our doorstep and is full of loyal Mayfair Granite customers who have used us for many years. As one of the UK's leading manufacturers of quartz and granite worktops, we are able to fit high quality, bespoke quartz and granite within a week of templating the worktop space at your Leeds home. I would have no hesitation in recommending Mayfair Granite, they made the process of choosing my new granite worktops simple and easy. Everyone always comments on how brilliant my new Star Galaxy worktops look. If you are looking for new granite worktops, look no further. Mayfair Granite has been absolutely fantastic from day one. They came out to template on Monday and had my new granite worktops installed the same week. We would like to thank you and your team for the efficient service which you gave us recently. Your guys worked extremely hard and did a wonderful job from beginning to end we are more than pleased. 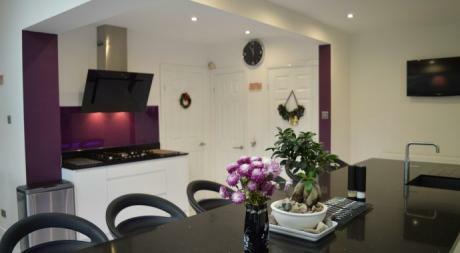 The worktops are all we could have wished for and more, the kitchen looks magnificent!! We would highly recommend your company and would be more than pleased if any future customers would like a testimonial from us. Very pleased with the instillation it looks good in the kitchen and works well with the units and floor tiles. Thanks to Kyle and the other guys who worked with him for a job well done. You can arrange a templating survey in Leeds with one of our stonemasons at a time that is most convenient for you. Our stonemasons will have an in depth discussion with you about overhangs and joints in the granite or quartz, and are able to provide millimetre accurate worktops. Working closely with you the customer, we pride ourselves on delivery first class service to all of our customers, giving a personal approach to ensure that your worktop is exactly what you’re looking for. Our granite and quartz is high quality, fully templated and polished at our UK based workshops, making fitting granite worktops in Leeds easily achievable with a quick turnaround. With over 25 years in the granite and quartz business, we have highly skilled technicians and installers available to keep you up to date with the progress along the way. We are also one of the most reputable granite and quartz suppliers in the UK across all trades and are able to provide competitive pricing and professional service from start to finish.